We at PHARMALOG - Institut für klinische Forschung GmbH [Institute for Clinical Research, GmbH], are responsible for this online offer and, as a provider of a teleservice, are required to inform you at the beginning of your visit to our online offer about the type, scope and purposes of the collection and use of personal data in precise, transparent, understandable and easily accessible form and in clear and simple language. The content of the information must be available to you at all times. We are therefore obligated to inform you about which personal data is collected or used. Personal data are considered to be all information relating to an identified or identifiable natural person. We attach great importance to the safety of your data and compliance with data protection regulations. The collection, processing and use of personal data are subject to the provisions of the currently applicable European and national laws. The following data protection declaration serves to show you how we handle your personal data. For better comprehensibility, our data protection declaration does not differentiate between the genders. For the purposes of equal treatment, corresponding terms apply to both genders. Article 4 of the EU Data Protection Ordinance (DSGVO) explains the meaning of the terms used, e.g. "personal data" or "processing". The personal data of users processed within the scope of this online offer include inventory data (e.g. name and addresses of customers), contract data (e.g. services used, names of agents, payment information), usage data (e.g. websites visited on our online offer, interest in our products) and content data (e.g. entries in the contact form). In this case, "users" includes all categories of persons affected by data processing. This includes, for example, our business partners, customers, interested parties and other visitors to our online offer. We guarantee that we collect, process, store and use your data only in connection with the pro-cessing of your enquiries and for internal purposes as well as to provide services or content re-quested by you. - on the basis of our legitimate interests. Data are only transferred to third parties within the framework of legal requirements. We only transfer user data to third parties if this is necessary, for example, for contractual purposes or on the basis of justified interests in the economic and effective operation of our business operations. If we use subcontractors to provide our services, we take appropriate legal precautions as well as appropriate technical and organisational measures to ensure the protection of personal data in ac-cordance with the relevant legal regulations. Third countries are countries in which the DSGVO law is not directly applicable. In principle, this includes all countries outside the EU and the European Economic Area. No data will be transferred to a third country or an international organisation without your consent or without a legal basis. We adhere to the principles of data economy and data avoidance. This means that we only store the data you provide for as long as necessary to fulfil the aforementioned purposes or as long as the various storage periods stipulated by the legislator. If the respective purpose becomes obsolete or after the expiry of the corresponding periods, your data will be blocked or deleted routinely and in accordance with the statutory provisions. We have developed an internal company concept to ensure this procedure. If you contact us by email, you agree to electronic communication. When you contact us, personal data is collected. Which data are collected when you complete a contact form can be seen from the respective contact form. The information you provide will only be stored for the purpose of pro-cessing your enquiry and for possible follow-up questions. We use software for the maintenance of customer data (CRM system) or comparable software based on our legitimate interests (efficient and fast processing of user enquiries). Therefore, no data is passed on to third parties. Please note that mails can be read or changed without authorisation and unnoticed during transmis-sion. Please also note that we use a software for filtering unsolicited emails (spam filter). The spam filter can reject emails that have been falsely identified as spam by certain features. You have the right to obtain information about your stored data free of charge. Upon request, we will inform you in writing and in accordance with applicable law, as to which personal data we have stored about you. This also includes the origin and recipients of your data as well as the purpose of data processing. If your data stored with us is incorrect, you have the right to have it corrected. You can request restricted processing, e.g. if you dispute the accuracy of your personal data. You can also have your data blocked. To ensure that your data can be blocked at any time, these data must be kept in a block file for control purposes. You can also request the deletion of your personal data, as far as no legal storage obligations exist. If such an obligation exists, we will block your data upon request. If the relevant legal requirements are met, we will delete your personal data even if you do not request it. You are entitled to ask us to provide the personal data transmitted to us in a format that permits the transmission to another location. You have the option to revoke the use of your data for internal purposes with effect for the future at any time. All you need to do is send an email to pharmalog@pharmalog.com. However, such revo-cation does not affect the legality of the processing procedures carried out by us up to that point. This does not affect data processing with regard to all other legal bases, such as the initiation of contracts (see above). We take contractual, organisational and technical security measures in accordance with the state of the art in order to ensure that the provisions of data protection laws are observed and thus to pro-tect the data processed by us against accidental or intentional manipulation, loss, destruction or against access by unauthorised persons. In order to protect the confidentiality of your personal data stored with us, we have taken various access and control measures. In order to protect the integrity of your personal data stored with us, we have taken various transfer and input control measures. In order to protect the availability of your personal data stored with us, we have taken various order and availability control measures. Our applied security measures are continuously improved in line with technological developments. Despite these precautions, and due to the uncertain nature of the Internet, we cannot guarantee the security of your data transmission to our online offer. Therefore, any data transmission from you to our online offer is at your own risk. Persons under 16 years of age may not transmit any personal data to us without the consent of their legal guardians. Personal information may only be made available to us by persons under the age of 16 with the express consent of their legal guardians or by persons aged 16 or older. These data will be processed in accordance with this data protection declaration. Persons under 18 years of age may not transmit any personal data to us without the consent of their legal guardians. Personal information may only be made available to us by persons under the age of 18 with the express consent of their legal guardians. These data will be processed in accordance with this data protection declaration. The responsible party is PHARMALOG - Institut für klinische Forschung GmbH, Oskar-Messter-Straße 29, 85737 Ismaning, Germany. The legal basis for the processing of the data with the applicant's consent is Art. 6 para. 1 lit. a GDPR. Through your application PHARMALOG - Institut für klinische Forschung GmbH receives information (both in paper format and in digital form), mostly name, address, date of birth, place of birth, information on school and vocational training, further education and training and about qualifications and certificates. 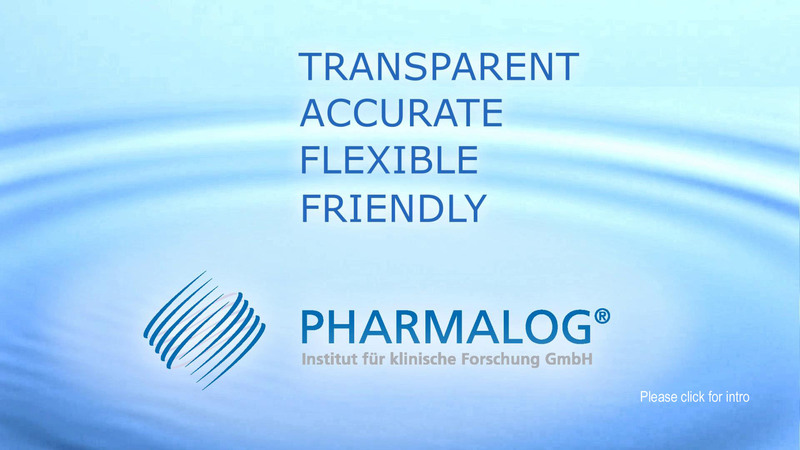 PHARMALOG - Institut für klinische Forschung GmbH collects, processes and uses your personal data exclusively for the application process (=initiation of an employment relationship). Your data will only be processed for purposes other than those mentioned insofar as such processing is permissible pursuant to Art. 6 para. 4 GDPR and is compatible with the original purposes. We will inform you of such further processing of your data. The applicant data are stored and processed in personal data processing systems. The technical installation is designed in such a way that only a narrow circle of specially authorised persons are allowed to access the data and any other access or any other knowledge of the data is excluded in accordance with the state of the art. Your personal data will only be stored as long as knowledge of the data is required for the purposes of the employment relationship or the purposes for which they were collected or as long as legal or contractual retention regulations exist. Your data will not be disclosed to third parties. If no contractual relationship is established, we will keep your application data for 6 months for the purpose of AGG (Allgemeines Gleichbehandlungsgesetz - German anti-discrimination legislation) verifiability. When a contractual relationship is established (=employment), we will transfer the necessary information into the personnel file. You have a right to information about the personal data stored about you, about the purposes of the processing, about possible transmissions to other places and about the duration of the storage. You may also receive extracts or copies to exercise your right to information. Should data be inaccurate or no longer necessary for the purposes for which they were collected, you may request the correction, deletion or limitation of the processing. Should your particular personal situation give rise to reasons against the processing of your personal data, you may object to the processing if the processing is based on a legitimate interest. In such a case we will only process your data if there are special compelling interests. In individual cases we may obtain your consent to the processing or transfer of your data. This may be the case, for example, if your application is kept for a longer period of time or if your application is considered for another position within our company. Your consent is voluntary in these cases and can be revoked by you at any time in the future. We reserve the right to amend our data protection declaration from time to time so that they always comply with current legal requirements or to implement changes to our services in the data protec-tion declaration. This, for example, concern the introduction of new services. The new data protec-tion declaration will then apply for your next visit. The foregoing services of our online offer are not intended for citizens of the Russian Federation residing in Russia. If you are a Russian citizen resident in Russia, you are hereby expressly informed that any personal data that you provide to us via this online offer is entirely at your own risk and responsibility. You further agree that you will not hold us responsible for any failure to comply with Russian Federation laws.